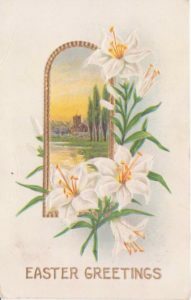 This card dated April 2, 1915 and addressed to Dear Sister and signed with an L. It was probably also from Letter. She talks of plans for summer visits. 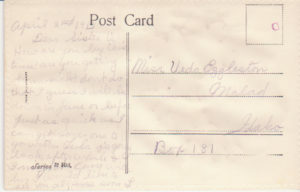 Vedia was in Malad, attending school. 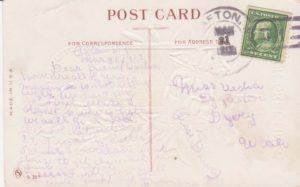 This card was sent to Vedia in Deweyville, Utah from her friend Kathryn who was still in Afton. 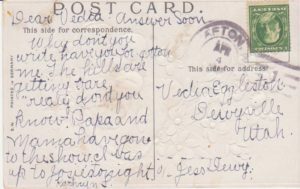 Vedia would have been with her sister Connie and husband Jesse Dewey, whose name is also by the address. 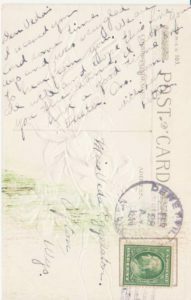 This card was sent March 31, 1912 from a friend in Afton. 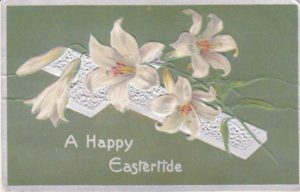 It s addressed to Miss Vedia Eggleston, Dwey, Utah. I assume this was also when she was in Deweyville with her sister Connie and husband Jesse Dewey. 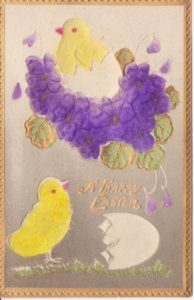 How this card managed to find her is remarkable to me, and for 1 cent, even. 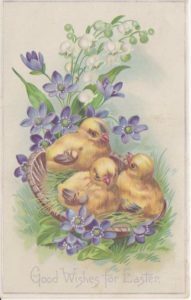 So I share these cards with you for no cost at all, with my added greetings for a Happy Easter!